Myanmar's recent pivot from China toward the West, and a more open government, came as a surprise to many outsiders. In rapid succession, President Thein Sein's government suspended the $3.6-billion Chinese-built Myitsone hydroelectric project, held nominally free elections and released political prisoners, including opposition leader Aung San Suu Kyi. The Times' article is particularly deceitful on several fronts. First, such "progress" has not been underway for even a year, and considering the level of repression we have been told exists in Myanmar, nothing resembling a "free," "open," or "independent" nation could take shape in such short time even with the best intentions and most expedient reform policies in place. What the Times and its corporate-financier sponsors are really celebrating is the open doors their long ousted corporate-financier interests are now enjoying after decades of exclusion. Image: "Increasingly open, public protests," as the LA Times calls them, are acceptable so long as they target China's interests. This protest is allegedly villagers protesting a Chinese copper mine, a protest Aung San Suu Kyi supported, while ignoring her own followers' genocidal assault on Rohingya refugees in Rakhine state. The West's narrative hinges entirely on the general public's ignorance. The Times also categorically fails to mention who was really behind the derailment of the Myanmar-Chinese Myitsone hydroelectric project. While the Times, like many other outlets across the West's media monopolies, attempts to portray it as the "will of the people prevailing," it was in fact Aung San Suu Kyi and a myriad of Western-funded faux NGOs arrayed against the project specifically to disrupt and expel Chinese interests from the region. One of the most prominent of these NGOs is the "Burma River Network" (BRN). While BRN's website fails to mention where they get their funding or who they are affiliated with, California-based, Ford Foundation, Sigrid Rausing Trust, Tides Foundation, Open Society-funded "International Rivers (page 3)" who is also active in blocking the development of Myanmar's rivers, gives them away by listing them as "partners" alongside the "Kachin Development Networking Group" (KDNG). Together these organizations interlock, cross-reference, and cross-post with other US-funded NGOs operating in Myanmar. These include the Irrawaddy, Era Journal, and the Democratic Voice of Burma, all admitted by the Burma Campaign UK (page 15) to be funded by the National Endowment for Democracy (NED) along with "Mizzima" also fully funded by NED and Soros' Open Society. Of course, each weighed in on the proposed dam, and each portrayed it as having a negative social and environmental impact on Kachin State. US-based International Rivers hailed the halting of construction as a "huge success for civil society groups in Burma, China and internationally," while NED-created Irrawaddy solemnly reported in 2008, "Irrawaddy Dam Construction Begins, Human Rights Abuses Begin," where the article bemoans China's investments in Myanmar before citing a single, anonymous "witness" who claims soldiers providing security for the construction site are disrupting people - as proof of "human rights abuses." The Irrawaddy also makes reference to the "Kachin Environmental Organization," a founding member of the above mentioned "Burma River Network," who in turn has dedicated entire sections of their website to chastising all dam construction within Myanmar. Aung San Suu Kyi as well played a leading role protesting and ultimately halting the construction of the Myitsone Dam. The Western-funded International Rivers reported, "Aung San Suu Kyi Joins the Campaign to Save the Irrawaddy," while the NED-created Irrawaddy paper reported, "Suu Kyi Attends 'Save the Irrawaddy' Art Event." The LA Times also celebrates what it calls "increasingly open, public protests." 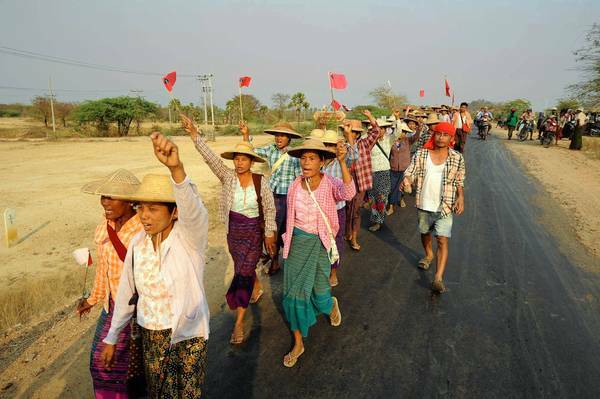 However, these are only protests against Chinese interests in Myanmar. And while these "open public protests" take place with the full backing of the West and its media monopolies, with any attempt to crackdown on them decried as an assault on human rights, the West's own proxies are slaughtering Rohingya refugees by the dozens with little or no serious action taking place. Such double standards were acutely prominent when Aung San Suu Kyi spoke up against abuse alleged against her "Saffron monk" protesters during an anti-China rally at a mine, while she remained silent while these same protesters butchered Rohingya across Rakhine state. Opposition leader Aung San Suu Kyi has demanded an apology for monks hurt in a violent police crackdown at a Chinese copper mine protest, after she held talks with the two sides. 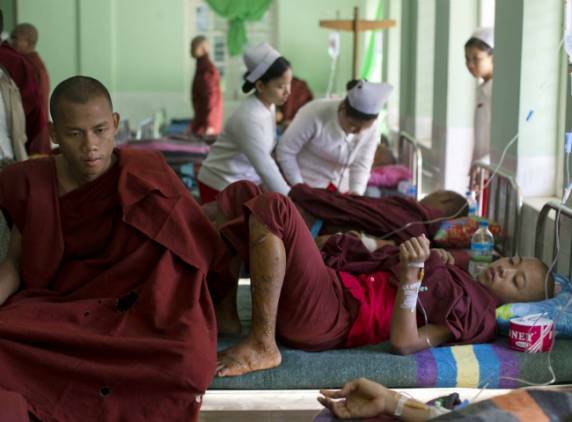 The "monks," of course, form the foundation of Suu Kyi's so-called "pro-democracy" movement, as well as the leading front carrying out genocidal violence against Myanmar's Rohingya population. Suu Kyi's recent demand for an apology stands in stark contrast to her habitual silence over the plight of the Rohingya. The common denominator behind this consistent hypocrisy is the targeting of Chinese interests across the country. Image: The Western media gladly fills their coverage of the Monywa mine protest with images of battered, "victimized" "monks," while downplaying both the violence these same "monks" have visited upon Rohingya refugees in Rakhin state, as well as the indefensible silence of Aung San Suu Kyi regarding that violence. In fact, Suu Kyi's silent complicity with the genocide of the Rohingya is not mere double standards. The violence her supporters are creating as they exterminate the Rohingya serves to deliberately destabilize yet another epicenter of Chinese interests, its port and logistical hub in Sittwe, Rakine, and pipeline and road it is constructing across Myanmar and into Yunnan province, China. The West has insidiously couched its hegemonic designs behind "freedom," openness," and "independence," when under closer inspection, it is plainly obvious that it is implementing none of the above. That is of course unless by "freedom" and "openness" one means for the West's corporations to pillage and exploit Myanmar without nationalist boundaries obstructing them, and "independence" as meaning "independence" from its traditionally allies, to be replaced by a new servile dependency on Wall Street and London's global financial order. While it may be argued that China's relationship with Myanmar falls short on many fronts, it is assured that Myanmar's new relationship with the insidious, manipulative interests of Wall Street and London, the heirs of the imperialists who subjugated Myanmar so many years ago will, set new a new standard for exploitation, destitution, disparity, and subjugation - especially as the West attempts to array Myanmar along with its other Southeast Asian neighbors against China to fight its proxy war with Beijing well into the 21st century.